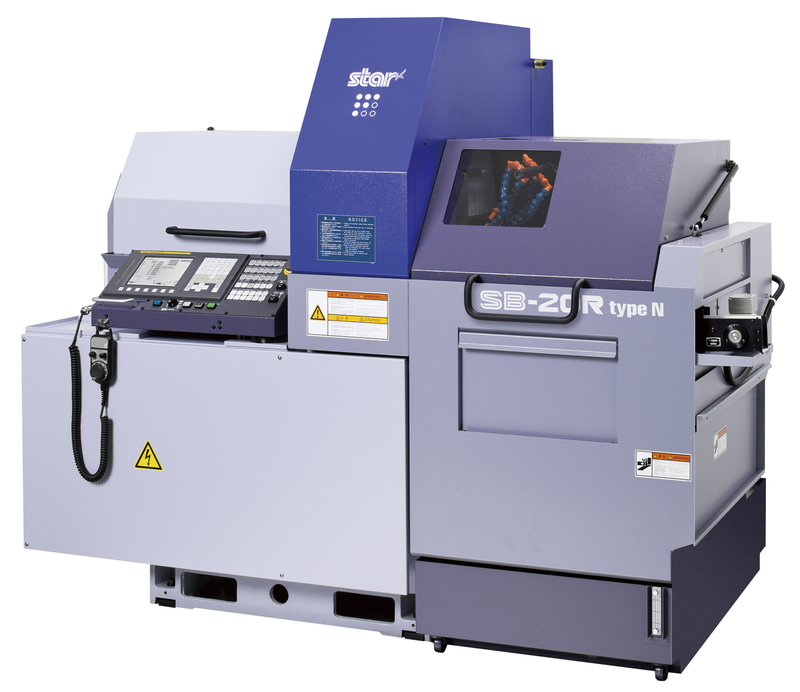 Star Micronics has developed the "SB-20R type N" as a new non-guide bush type (Note 2) in the SB series of the Swiss type automatic lathes (Note 1). This type is targeted to the automobile and construction machinery industries and scheduled to be offered for sale in June, 2013. Since the release of the first model, the SB-16 in 2003, the SB series has been a best-selling series and highly rated in the market. The new SB-20R Type N will be the top model in this series to date. Compared with other Swiss type automatic lathes that use a guide bush, the "SB-20R type N" is better suited to the machining of short components and able to eliminate waste from materials. The tool post employs a slant-type slide guideway (Note 3) and both the main headstock employs a spindle sleeve-type slide guideway as Star original structures (Note 4) to enhance the machine rigidity and accuracy in continuous machining. The maximum machining diameter is ø20mm. The main spindle uses a built-in spindle. Both the main spindle and sub spindle are equipped with a C-axis control function as standard. There are two types of a gang-type tool post for front end working – a 4-spindle type and a 5-spindle type. The 5-spindle type has 5 power tools among which 3 power tools can be changed. Through a variety of combinations, a maximum of 30 tools can be attached. The tool post for rear-end working has upgraded functions including eccentric drilling, slitting and other complex machining on the rear side. The NC unit is equipped with various help functions such as an alarm help function to check alarm contents on the NC screen. In addition, a swing-type operation panel and a manual pulse generator for easy setup work are provided in order to ensure improved operability and workability. This machine will be exhibited and demonstrated at the 26th Japan International Machine Tool Fair (JIMTOF2012) to be held at Tokyo Big Sight (Tokyo International Exhibition Center) from November 1 through November 6, 2012. * This is a non-guide bush type which does not use a guide bush, and the minimum remaining material length is 31mm (for the bar feeder to discharge materials forward). As a result, the material cost can be significantly reduced. * The main headstock employs a spindle sleeve-type slide guideway structure which reduces load to the headstock during cutting and ensures its rigidity. * The machine optionally employs a cartridge-type cross drill unit (5-spindle type). By combining a variety of tool units at 3 cartridge positions, a maximum of 30 tools can be attached. * The 4-spindle unit for rear-end working accommodates a tool drive unit to enable upgraded complex machining on the rear end. * Both the main and sub spindles are equipped with a C-axis control function as standard. The Swiss-type automatic lathe was devised as watch component processing machine in Switzerland in 1870s. Known as a "sliding head-type automatic lathe" as well, it has remarkable characteristics of high-precision cutting of components with longer length compared with the diameter. In general, if long and narrow parts are processed with a general-purpose lathe, flexure will occur on the workpiece, making finishing with the correct dimensions impossible. The Swiss-type automatic lathe utilizes a guide bush to function as a material rest. The tool, positioned at a certain distance from the guide bush, gives only a cutting motion to the direction of outside diameter. This allows the workpiece to be cut accurately with no flexure. As for axial motion, the headstock, rather than the tool post, moves while clamping a workpiece. Both the machine base and the tool post are in a slanted structure by machining each sliding section in a trapezoidal shape called a dovetail groove. This structure allows each sliding surface to come into complete contact and improves the machine rigidity. The ball screw center and the cutting point come close to each other so as to reduce load (moment load) in the torsional direction due cutting resistance. The slideway is machined according to the OD size of the spindle sleeve of the headstock which moves while clamping the workpiece. By eliminating the gap between the spindle sleeve and the guideway, load applied to the headstock during cutting is supported by the slide guideway to improve the headstock rigidity.